In the Old West a man is murdered by an outlaw named Tom Chaney (Josh Brolin) for his gold and horses. Looking to avenge his death is the man's fourteen-year-old daughter, Mattie Ross (Hailee Steinfeld). She's a tenacious young girl who arrives by herself in town to try and sell some of her father's horses back to the original trader. She also looks to employ a man who will be able to hunt down and capture Chaney. One of the men suggested to her is Rooster Cogburn (Jeff Bridges), a drunken Marshall, in court for shooting someone in cold blood. Mattie also meets the Texas Ranger LaBoeuf (Matt Damon), who is also looking to bring Chaney in for a different murder. LaBoeuf decides to team up with Cogburn. They they take off without Mattie but, true to her resilience and determination, she takes up after the men to join them in the pursuit. The Coen brothers have touted this not as a remake of Henry Hathaway's 1969 Western (which starred John Wayne as Cogburn), but as a readaptation of Charles Portis' 1968 novel. There is some contention to this as many scenes in this version run parallel to the original film. Regardless, the story still finds relevance today, with America's sense of violent righteousness in the Vietnam War now replaced by paralells to religious fundamentalism, extreme right-wing politics and America's hotly debated involvement in global conflicts; if anything, this modern critique is the stronger of them. The film smartly opens with a quote from The Old Testament, The Book of Proverbs: "The wicked flee when no one pursues". This is followed by an early scene where three men are publicly executed. Their hanging is met by applause from the crowd. The notion of justice being drawn from the power of Christianity is continued and felt most heartedly by the Bible-quoting Ross. Her belief that nothing is free except the grace of God fuels her tenacity and her drive, thus embodying the notion of American accomplishment through Christian extremism. Aesthetically, the Coen brothers have rarely shown as much restraint and poise in their craft as they have here. They have stripped back their penchant for bizarre comic characters to make what is most simply a beautiful, classic Western. Their attention to detail and their delicacy is at times stunning. Consider the close-up of LaBoeuf's spurs on the back of his boots, the crooked teeth of the outlaw Lucky Ned Pepper, or the way the snowdrops fall as Ross and Cogburn ride through the woods together. The Coen's never linger too long on landscape shots, though, and the film's quiet beauty is deliberately offset by the dark costumes and dusty gravel roads, reminding us of the era's conservatism and its often primitive way of life. Equally authentic is the performance of Hailee Steinfeld, a then thirteen-year old in her first feature. Amidst the presence of several Hollywood heavyweights, she is extraordinary. The confidence and the self-assurance she displays is precisely what was intended for this role. She plays it perfectly. There is no better choice in Hollywood to play a drunkard than Bridges, either. It might not seem too dissimilar from some of the characters he's played before, but beyond his dishevelled face he convinced me that there was once a more resourceful Marshall in Cogburn. Matt Damon has more presence than Glen Campbell did (in the 1969 film) as LaBoeuf. There's more feeling and tension amongst this group, too, which helps quell some of the sagginess felt in the middle portion of the original movie. In particular, I enjoyed seeing the change in the Ross-LaBoeuf relationship from business rivals to one of a gentle admiration. The only flaw with the performances is that the characters can be difficult to understand at times, their heavy southern drawl having been written straight from the period. It becomes a problem especially when combined with Bridges' slurred speeches. There is also the thought that those who have seen the original already will have a particularly clear idea of the arch of the film's narrative. Nonetheless, it's been beautifully crafted and performed and like all the very best Westerns, it's pitched with a timeless moral compass. 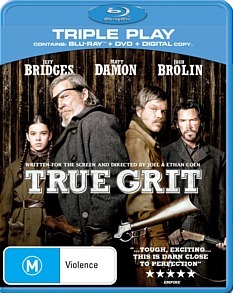 If you loved True Grit at the movies, than the Blu-ray version has definitely been designed for you. It contains a wealth of extras that goes into some detail about the creation of this powerful film but lacks commentary by the Cohen Brothers and cast unfortunately. It also features a DVD and digital copy of the film, so you can enjoy the movie on a variety of formats. Video and Audio quality is outstanding and Paramount continue to the leaders in quality releases.